Terri received a Bachelor of Science degree in Communication Disorders from Marywood University, in Scranton, PA, and her Master of Science degree in Speech Language Pathology from Rutgers University. Terri has worked in early intervention, outpatient pediatrics, inpatient hospitals, head injury rehab and long term care. She has been a speech language pathologist at Clarity since 2016, after relocating to the area from Pennsylvania. Terri has a history of working with those who need assistance in early development of Speech and Language, rehabilitation post trauma or a medical issue resulting in the loss of speech and language abilities. She loves to work with all people, both children and adults as a Speech-Language Pathologist to provide functional communication to all. 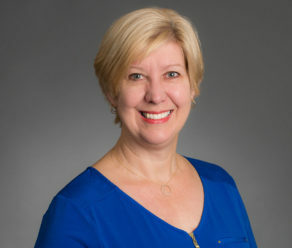 Terri’s special interests include treating and educating adults, children, and families dealing with language deficits including; expressive and receptive language deficits; articulation errors and auditory processing/phonological disorders. Terri is also a RYT-500 Registered Yoga instructor, and applies many of the facets of her yoga practice to her therapy session, including the calming effects of good breathing and quiet time, and movement to enhance and integrate learning. Terri loves traveling with her husband, Chris, to see new places and spending time with her grown children. Terri also has two sons and daughter in laws: Adam and Natalie and James and Sara. She has a Bichon Frise named ‘Rocko’ who truly believes he is a king. Terri’s favorite ice cream is Butter Pecan.